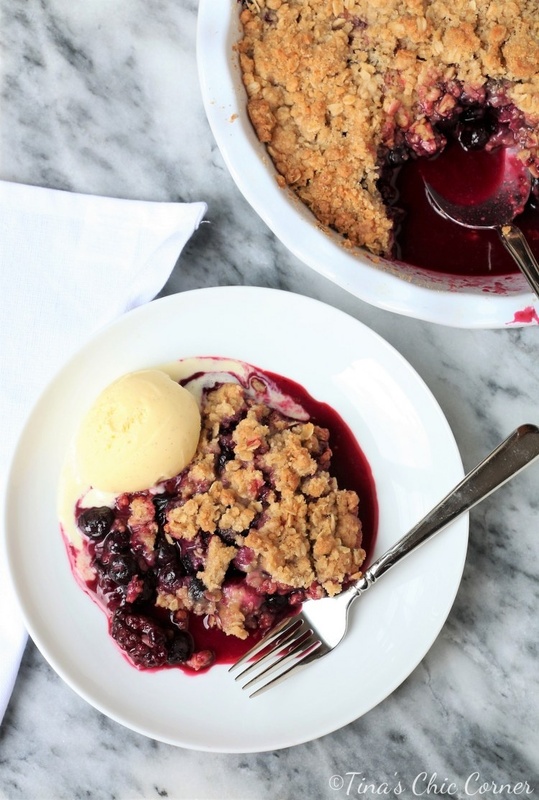 Which is better, a berry pie or a berry crisp? My parents came over for dinner on Saturday and I wanted to make a lovely summer dessert. I could have made blueberry or triple berry pie , because pies are yummy, but I wanted something easier and quicker. 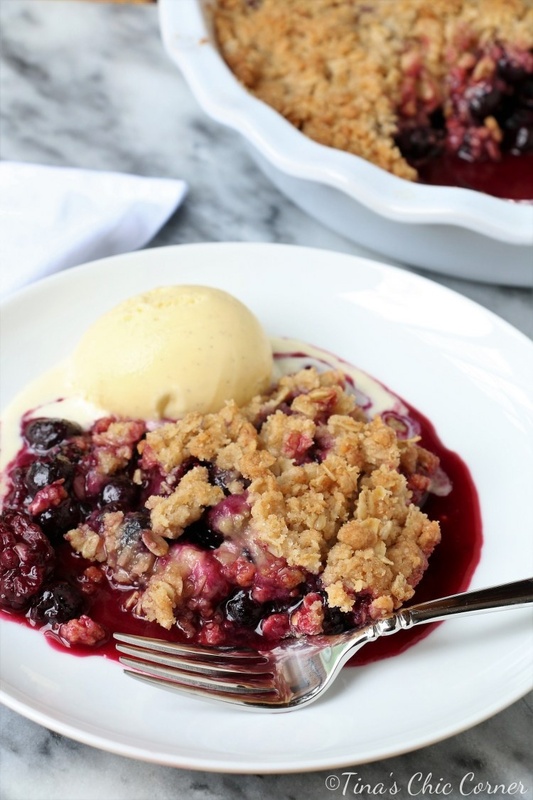 That’s where this berry crisp came in. This crisp is all that you would expect in great crisp. 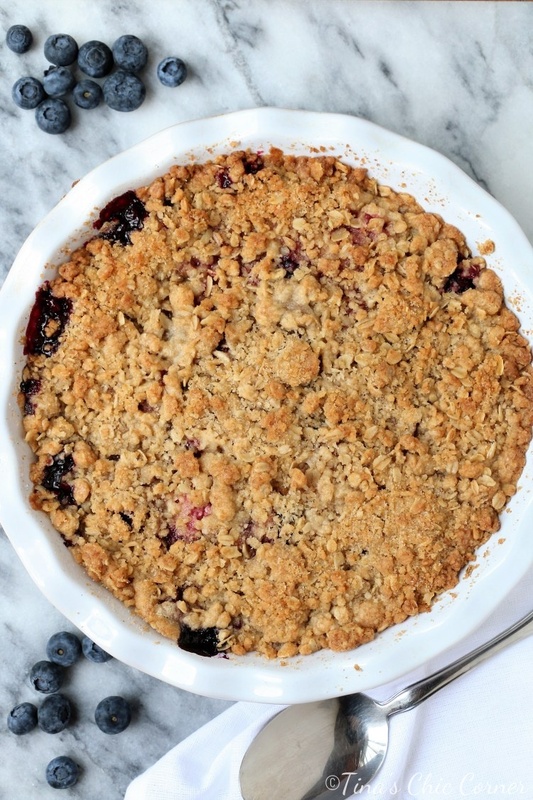 It has a crispy, sugary, buttery coating on top of a boat load of yummy fruit. I used an assortment of berries today because they’re in season (i.e. cheap and delicious). You can use whatever berries you want, even strawberries would be a lovely addition or substitution. When Fall comes around, you can use this same recipe with apples. It’s pretty versatile. I think that I could have baked this crisp a longer (and the apple version might take a different amount of time) because when I cut into it there was more liquid in the berry filling than I would have liked. My husband calls that pie soup and has never once complained about it. To tell you the truth I was upset that there was any liquid at all. But then I added a big ole scoop of vanilla ice cream and I wasn’t sorry about the berry juice. In fact, the berry juice served for another lovely purpose. The next morning my husband made French toast and we drizzled some of it on top instead of syrup. It was oh so yummy. I suppose that’s another reason why I love crisps. If you have the dreaded “soup” problem, the crisp is still a winner. However, if that happened to a pie, then the bottom crust could be soggy instead of properly cooked and that’s not really a good thing. So does that mean that I prefer crisps over pies? Even though it takes a little more love and attention to make a pie, I’d have to say that I still prefer a pie. I think my husband would agree. Maybe next time I’ll try to combine the both of best worlds and make a pie crisp. Overkill? Yum, I doubt it. Preheat the 375 degrees F.
In a big bowl, whisk together the flour, oats, brown sugar, 1/4 cup white sugar, cinnamon, and salt. Add the cold butter and mix with a pastry blender or fork until it’s crumbly. Store the crumble mixture in the refrigerator while you make the berry filling. In a small bowl, whisk together the 1/3 cup white sugar, cornstarch, and lemon zest and set it aside. Wash the raspberries, blackberries, and blueberries and make sure that there are no pesky little stems or weird looking berries. Pour all of the berries into a large bowl and add the sugar mixture and gently mix everything together. Pour the berries into a 10 inch round pie plate. 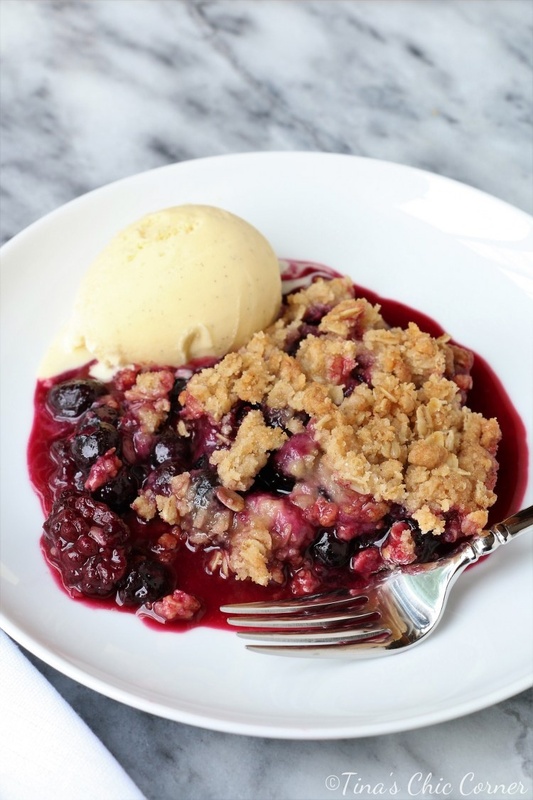 Remove the crumble mixture from the refrigerator and sprinkle it evenly over the berries. Bake it in the preheated oven for about 45 minutes or until you see that the filling is bubbling and the crumble is a golden brown.